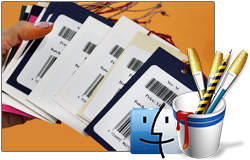 Barcode generator software creates barcode labels with support to major Linear and 2D barcode font standards. 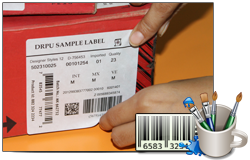 Software allows user to generate customized labels with advance barcode designing view facility. Barcode label software generates bulk numbers of barcodes that are easily readable and printable by commonly used barcode scanners and printers. Barcode Generator - Corporate Edition is designed to generate bulk number of barcode labels, tags, stickers and coupons in linear and 2D barcode font standards. Corporate barcode software provides inbuilt email facility which allows users to send generated barcode tags at specified email address. Mac Barcode Generator - Corporate Edition is developed for creating multiple barcode labels on MAC machine. For designing barcode labels, Program provides advanced drawing tools including line, rectangle, text, rounded rectangle, ellipse, barcode, signature, watermark, images etc. Barcode generator – Professional Software provides facility to generate barcode labels, stickers and offers inbuilt printing settings option to print designed barcodes. Barcode Generator – Standard Edition enables you to create and print barcode images in linear and 2D barcode font standards for different commercial organization. Barcode Generator Software for Mac helps to create barcode labels and coupons for inventory control, healthcare, postal services and other business industries. Post office barcode generator software is capable to generate bulk numbers of barcode labels, images, stickers and tags for banking sector and post office services. Industrial Barcode Generator software helps you to design and print different types of barcode stickers, tags and coupons for warehousing and manufacturing industry. Simple to operate barcode generator is useful for designing printable barcode images, stickers and labels for packaging supply and distribution industries. Barcode Generator for publishing industry easily makes various kinds of barcode book stickers and labels in rectangle, ellipse and rounded rectangle shapes. Barcode Generator software is easy to use program that helps you to design and print barcode labels and stickers for inventory management and retail business. Barcode Generator for healthcare industry software creates various types of barcodes, pharmaceutical labels and other types of labels for hospital equipments and products. Card Maker Software allows you to design and print product labels, birthday cards, greeting cards, ID badges, flyers, asset tags, business cards and other types of cards and labels. 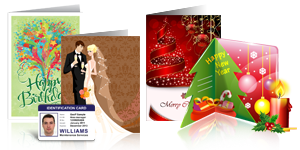 Card maker program provides different designing objects (Pencil, line text, ellipse etc) to create cards for various occasions.